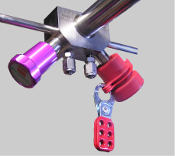 The VKC-102 is a Custom Lock Out Tag Out Device for Parker/SAES Valve Knobs. This LOTO device is designed specifically for the Valve Knob shown in the picture of the assembly. The VKC-102 is available in the Standard Red color but can also be ordered in custom colors such as Blue, Green, Yellow, and Clear. VKC-102TM "Patent Pending"